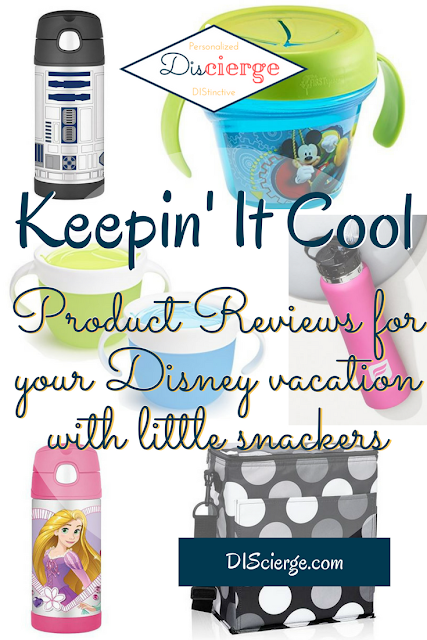 If you’ve ever had leaky coolers, warm water bottles, or strewn snack cups, you’re in the right place. These are the handful of “little snackers” essentials I’m covering today. We had a few pleasant surprises with the “cool” items we brought with us so I wanted to share our success. I’ve given you recommendations of food items to bring for your drive and in the parks in this post. Now I’ll recommend our water bottles and tell you about the cooler we used this time, as well as talk about snack cups. We didn’t have successful snack cups but I’ve already looked into solutions for next time and that’s what I’m sharing. Since this was a short trip, we didn’t think too much about which cooler, especially since we were on the Dining Plan. We took our small Thirty-One cooler because it’s a good size in the car. It was a good thing. We forgot our ice packs and had to make our own from ice and zip top bags. They leaked all over the place. There was standing water in the bottom of our cooler, yet the outside was totally dry. I have a similar capacity cooler I want to embellish and take on our next trip but I’m sure it will leak (we better remember the ice packs!). You can no longer get our exact cooler but it’s essentially the “Picnic Thermal Tote.” Ours has a top handle but no shoulder strap. This might not be the best shape for in the parks but it fits conveniently in our mini-van between the center console and dashboard. The shoulder strap makes the newer version a better fit on a stroller. We have to toss ours in the bottom basket which means it’s not upright. I think a wider and shallower cooler would be better in the parks but this will be more trouble in the car. I almost always take our 31 cooler for car trips (and to the beach, it fits in our utility tote with the towels). Thirty-one makes several thermals so if leaking is an issue (i.e. you want to avoid it), you have other shape options. Before I talk about water bottles, I want to talk about snack cups. We have one of these “snack catchers” but it doesn’t fit in the car seat/stroller cup holders and the lid comes off too easily. The opening is perfect, but otherwise, it’s not so useful. I noticed when doing research that this got great reviews but reviews for the two I’m listing below mentioned how they solved the exact problems this catcher has. I swear my oldest can spill anything so that’s the issue I’m trying to address. Nothing will allow her to feed herself while preventing every spill, I just need something that reduces how much spills when she knocks it over (and the youngest is still at a throwing age so let’s address that, too). Since our trip, I've given this Disney themed snack catcher a try; bonus that it’s Disney designs. The flaps on this is a little stiffer and the openings a little smaller. For our youngest, this is perfect. For my five-year-old, it's harder for her to use. There are also two-pack snack catchers which are similar, cheaper, and unbranded. My five year old loves these and so do I. They are a great size. Note that my five-year-old can unscrew the top but she doesn't intentionally try to make a mess so it's not a problem. If your kids are the type to take a lid off and dump it everywhere, on purpose, it's not going to help that much. 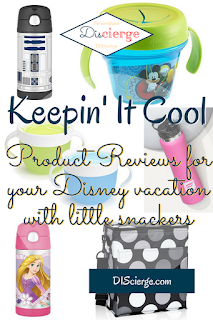 I actually think a good insulated water bottle is essential for any Disney vacation. So far, they don’t have water bottle filling stations. Insulated bottles hold less so consider bringing a shorter “cup” to fill at water fountains and then fill your bottles with the cup. I’m even considering bringing a wide flexible tube to solve this so I can fill faster (I don’t like holding up the line). This trip, we had one of my Fabletics insulated bottles. They really don’t hold a lot but we refilled the bottle two or three times and the ice was still there (we didn’t drink enough so that was about six hours the ice lasted with refills of not-cold, but not-hot water being added). I should mention I buy straw bottles because I find I drink more that way. These are all insulated straw bottles. My daughter’s bottle was the big surprise. We had just grabbed a Disney princess metal water bottle at Office Depot at back-to-school time (because Rapunzel was staring at us). They were probably on sale and I don’t like plastic water bottles (for one thing, I’ve dropped and broken every one I’ve ever had, so now the extra thick plastic is in a landfill). Turns out it wasn’t just a metal bottle but an insulated bottle. It kept her water as cold as our bottle (the ice didn’t last as long because it holds less, so less ice to cool the water-fountain water). Her bottle is a Thermos “Funtainer,” not to be confused with the six million other insulated Thermos brand bottles. What’s the difference? As far as I can tell, the main difference is the little handle on the top. Let me explain what we like in addition to the fact it is an effective insulator. Our kids love the push button open. It’s easy, our “baby” can manage it. We had purchased him a Lion Guard bottle (plastic and rubber) before the trip (he didn’t have a bottle and it was an Animal Kingdom themed trip). He couldn’t open the flip up straw himself. Conversely, he’s constantly stealing his sister’s Funtainer bottle, partly because he loves the push button. We will be getting him his own for the next trip. Besides being fun, the lid keeps the straw clean. I assume it also prevents leaks as we’ve had none. The handle on this bottle is great because it automatically folds down but lets the kids carry the bottle without wrapping their hands around it. It usually takes two hands for them to hold around the bottle. The handle is one-handed and easier for them than a loop (we have other bottles in that style, so we know). The pop-up straw is great. I don’t know why, but it works. I don’t know if they don’t chew on it but at least there’s no annoying squeak while they do and there is no sign of chewing. Our daughter flattens every other straw. The shape either makes it too hard to chew (but easy to drink) or is really durable. Since we’re talking Disney vacation, this bottle comes in a bunch of Disney characters, plus other kid characters, and just colors. Note that these bottles are for cold items only, they aren’t to keep things hot. The link above is to the 12 oz. size. There is also a 16 oz. but I don’t see one listing with multiple designs. I’ll let you search if you want a bigger bottle (and check your local stores, as I said, ours came from an office store). Other Thermos bottles appear to have all the same features except the handle. For small kids, the handle is really essential if you want them to carry their own bottle. So there are my recommendations for some snack supply essentials. We weren’t there in the heat of summer (on purpose) but we still appreciated things being cool. If you will be there in late spring to Halloween, make sure you can keep things cool. Do you have a favorite supply you have to take? Leave a comment.